Have some fun and feel happy in your body! Belly dance is a great form of exercise and the benefits are both physical and mental. Women of all shapes and sizes, young and old can learn and enjoy belly dancing. 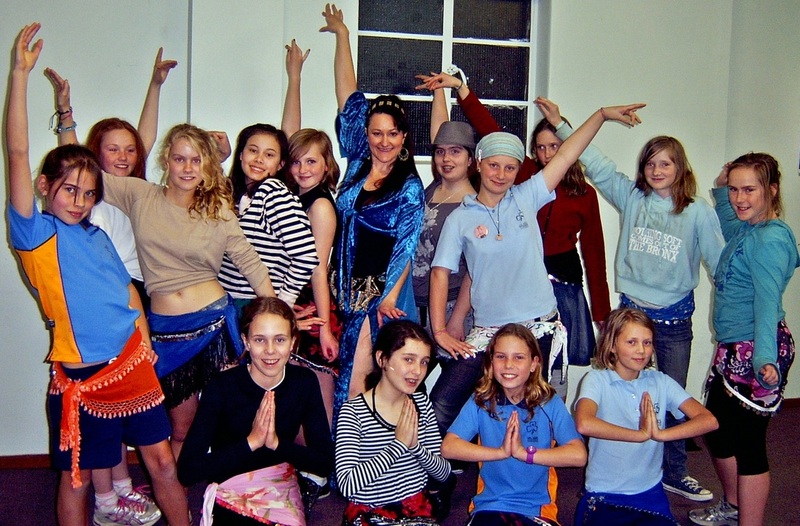 Kaylah teaches Belly Dance Classes and is also available to run One Off Bellydance Workshops suitable for Health Groups, Women's Groups, Community Centres and Fitness Centres within the Melbourne and regional areas. Kaylah’s teaching style is inclusive, catering for ladies of all ages, shapes and sizes who wish to experience the beauty of belly dance, increase fitness, improve self-confidence and have fun. Kaylah is available to present one off group belly dance workshops at your venue for special occasions, e.g. multi-cultural day, festival, sport activity session. 30 minute & 1 hour length belly dance workshops are available. Please contact Kaylah to discuss your requirements. * Come & Try Belly Dance Workshop: A performance then introductory bellydance lesson. In this workshop learn moves such as snake arms, hip circle, shimmy & more. Popular for community events, expos, open days, social groups & schools. Anyone at any level can join in! * Mum & Daughter Bellydance Workshop: A workshop that includes a performance, teaching fun bellydance moves suitable for all ages, interactive games and focus on having fun together. * Belly Dance & Happy Body Image: The workshop provides participants with the opportunity to try belly dancing and there is a focus on having fun and learning to live happily in your body. * 50th/60th Birthday Womens Workshop: Try something different to celebrate your birthday. Gather your friends together and have an introductory belly dance lesson in you own home. * Disability Support/Service Program Workshops: Weekly or one off workshops for women's groups, including participants with a disability. Discovering the joy of movement and increase self confidence with bellydance. 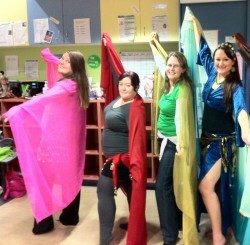 Includes dress up in sparkly bellydance scarfs. Available in Melbourne, Geelong and surrounding areas. Also available are Hen's Night Group Bellydance Lessons and Girls Bellydance Party Packages. For more information see Bellydance Parties. Kaylah is currently not teaching weekly belly dance classes at this time due to a focus on performing. Private lessons and 1 off workshops are available. Private lessons are available for those who wish to fast track their learning, individuals who prefer to learn in a one-on-one learning environment or those who are already learning dance and wish to focus their skills on particular areas. Beginner, Intermediate and Advanced tuition is available. Private belly dance lessons for women are available Monday, Wednesday & Thursday evenings or during the day some Monday & Fridays. Limited weekend times available. Please contact Kaylah to discuss your requirements. Kaylah is available as a relief bellydance teacher in the Melbourne area. If you are a dance teacher & require a reliable & motivated relief teacher on occasions get in touch. Beginner/Intermediate levels catered for. Relief classes can continue to focus on areas of your class program or one of my specialities. drum 5 commonly used rhythms and where they are played in songs. * Introduction to Dancing to Live Drumming Workshop: As a dancer, having an appreciation of the arabic drumming rhythms helps your dancing so much. The popular rhythms and patterns will be explained, as will how to interpret these into dance moves. Interested? Read my article published in OMEDA Magazine Finding the Heartbeat of Middle Eastern Dance.